When my little brother was born in 1993, I don’t think my parents were the only ones who didn’t know much about autism. For the next decade or so, as they tried to understand why my brother seemed constantly overstimulated by the world and heartbreakingly inconsolable at times, they did what many parents of children who would ultimately be diagnosed with autism did: they tried to experience the world through their child’s eyes and body. Autism was not widely discussed in the early ’90s, in part because there wasn’t much to discuss. The research was limited, and high-profile celebrity activists were few and far between. For those whose lives had not been directly touched in some way by autism (at least not yet), the general understanding of the condition was defined by cultural interpretations, such as Dustin Hoffman in Rain Man. For families raising children with autism — whether they had been formally diagnosed yet or not — it was an interesting time. The emergence of the internet provided a vital tool for parents, giving them access to information beyond what they could dig up at their local library as well as the opportunity to carve out community spaces and connect with other parents. Questions like “How do you deal with this?” or “What works for you?” are not unfamiliar to parents in general, but for parents of children with autism or sensory processing disorders of any kind, they can refer to situations more serious than the standard toy store tantrum. Parents were often desperate to help their child stop physically harming themselves (either intentionally or unintentionally) and to find something — anything — that might calm them in those moments when chaos reigned. My family did what many others did: tried various things and hoped that something would stick. My brother was ultimately more high functioning and verbal than children with autism are expected to be, but that was only after years of diligent intervention. When he was very young, the tone of every day of his life (and ours) was dictated by how he felt. On a good day, his meltdowns were infrequent and no one got hurt. I try not to dwell on what the bad days were like — as hard as they were for me and my parents, I can only imagine how they must have been for him. A number of the hallmark features of autism involve sensory processing. Specifically, children with autism tend to become painfully overstimulated by a variety of sensory input: sights, sounds, tastes, tactile sensations, etc. This was a tendency that Grandin was well aware of in herself from an early age and one that I remembered afflicting my brother. He was particularly overwrought about fire alarms, would often tear off his clothes in public, and has more or less eaten the same foods every day of his life for more than 20 years. Not unlike Grandin, he also had an interesting contradiction about touch. He did not like to be hugged and had a number of interpersonal struggles that made him seem “unaffectionate.” However, at the same time, he exhibited self-soothing behaviors that made it seem like he wanted to be wrapped up or held. In fact, if he was thrashing about in the throes of a tantrum, a firm hold not only kept him from hurting himself (or anyone in close proximity), it also seemed to calm him down. Grandin, who loves animals, spent much of her research career working with livestock. Her fascination with them began on her aunt’s farm when she was a child, during which time she observed the “squeeze machine” often used by dairy farms to quell anxious cows as they’re being branded. From there, she developed the concept for her own such device for people. 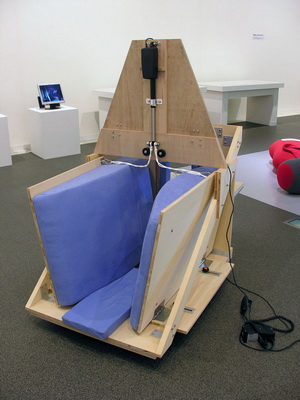 The prototype involved two air mattresses and a wooden framework that she could stand within and then control the degree to which she was compressed by the mattresses. Grandin’s brilliant, systems-thinking mind reasoned that something about the “deep touch pressure” provided by the squeeze machines calmed both the livestock and herself. Her seminal paper on the topic, Calming Effects of Deep Touch Pressure in Patients with Autistic Disorder, College Students, and Animals, was published in 1992 — one year before my brother was born. Grandin’s research defines deep touch pressure as “the type of surface pressure that is exerted in most types of firm touching, holding, stroking, petting of animals, or swaddling.” As she notes, it’s important to distinguish this type of touch from light touching, such as tickling or the sensation of hairs moving on the skin of your arm. That type of touch stimulates the nervous system and puts it on alert, which can then cause a person to feel anxious. Deep pressure touch, however, has been shown to have the opposite effect: it calms you down. “Research on autistic children indicates that they prefer proximal sensory stimulation such as touching, tasting, and smelling to distal sensory stimulation of hearing and seeing,” Grandin writes, citing a paper from 1981 that observed how children with and without autism responded to various sensory modalities. Other research Grandin discusses concerning deep touch pressure therapy (DTPT) applies more broadly to “neurotypical” folks as much as those with autism spectrum disorders. We’ve long known that newborns need close human contact not just to thrive, but to survive infancy at all. Those early experiences with touch – particularly being held and comforted physically by a caregiver — have been linked not only to how a child develops mentally, but physically as well. More recent research has shown that touch can have an almost miraculous influence on the health of preterm infants in neonatal intensive care units around the world. The impact reaches beyond babyhood, too — benefits can extend well into the first decade of a child’s life. DTPT research has also been shown to be helpful for children and adults who are not on the autism spectrum, but may suffer from anxiety. Occupational therapists have known for decades that deep touch pressure can help not just children with sensory processing disorders, but those with hyperactivity and attention deficit disorder, too. While there are certainly hug machine-inspired apparatuses in use, for those of us who don’t have the space (or wouldn’t even know where to start in terms of constructing one ourselves), weighted blankets are a more user-friendly and generally affordable option for providing the benefits of DTPT. And, since you can use them in bed, it’s also worth noting that weighted blankets have been shown to help with sleep, too. In the conclusion to her paper, Grandin points out that deep pressure touch can’t be expected to work for everyone, and not every child with autism will respond well to it. Still, her initial research and the two-decades-worth of additional research that followed it have helped countless families. By bringing to light the power of deep pressure touch, she’s given those struggling to help their children live in a world that is, at times, quite literally painful to bear an incredible tool and the previously unattainable possibility of calm.